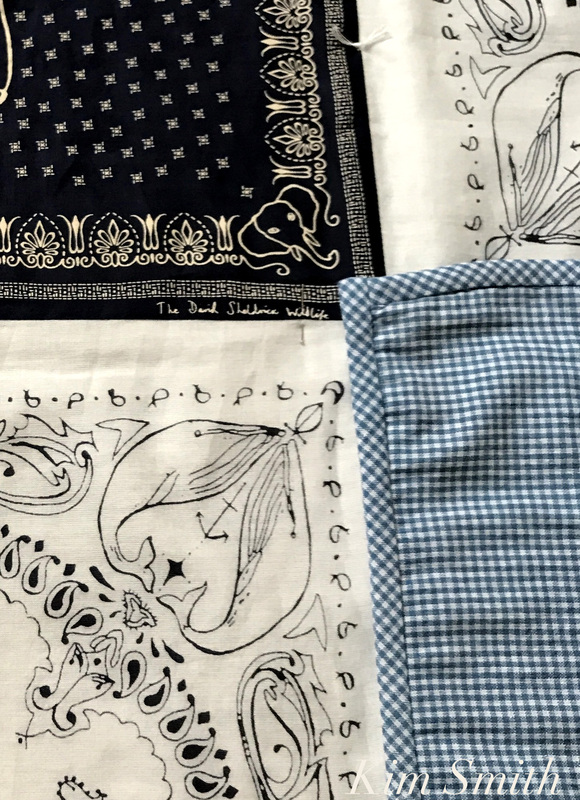 While looking for bandanas to make Charlotte, our baby granddaughter-on-the-way, a bandana baby quilt, I came across wonderfully whimsical animal inspired navy and white bandanas at J.Crew. 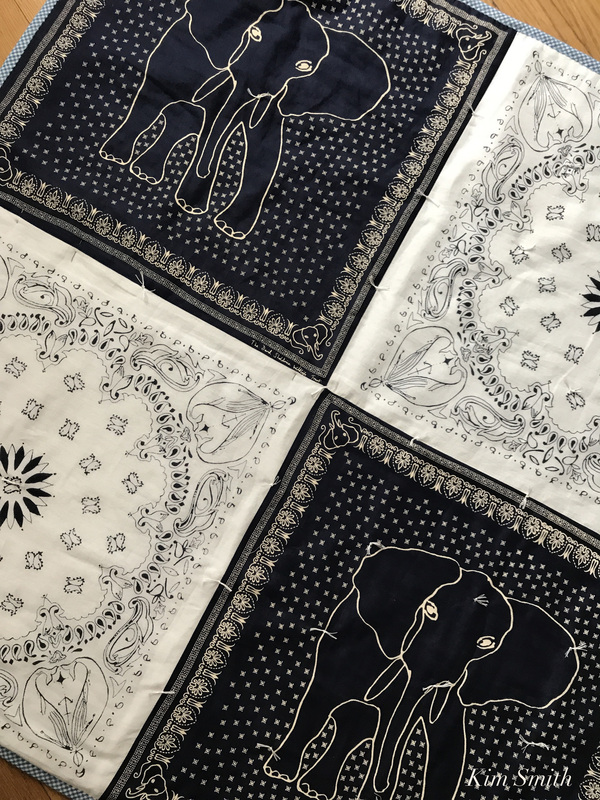 The elephant bandana has little elephant heads in the corners and the whale bandana has an overall pattern that includes fishes, anchors, and a compass rose. The bandanas are printed on an ultra soft, almost batiste-like quality cotton fabric. Recalling that newborns can mostly only see black and white for the first three months, and that the J.Crew designs are so charming, I abandoned the pink idea and went for blue and white. And, a portion of the sale from the bandanas goes to support wildlife foundations. 1) Prewash bandanas, cotton batting, and backing fabric. Press. 2) Stitch together the four bandanas. Bandanas are not a woven design and oftentimes are not printed on the square perfectly. You have to fudge it a little and not be too fussy at this stage. 3) Press the bandana quilt top seams flat. Place the quilt top over cotton quilt batting. Pin or baste the batting in place. Trim batting close to quilt top edge. 4) Place quilt top and batting unit on top of cotton backing. Pin or baste through all three layers to keep in place. Trim to neaten edges. 5) Cut 4 bias strips, in desired width, in backing fabric, the length of each edge, plus two inches. I like to cut my bias strips 2 and 7/8 wide inches for binding a quilt. Fold bias strips in half and press. 6) Stitch one bias strip to the right side of the quilt, along one length. Turn to the wrong side and slip stitch in place. Trim ends of bias binding. Apply same instructions to the opposite length of the quilt. 7) Follow #6 for the two remaining lengths, neatly tucking in the ends. 8) With embroidery floss, knot the quilt through all three layers, approximately every 4.5 inches. Wrapped and ready for cuddling! 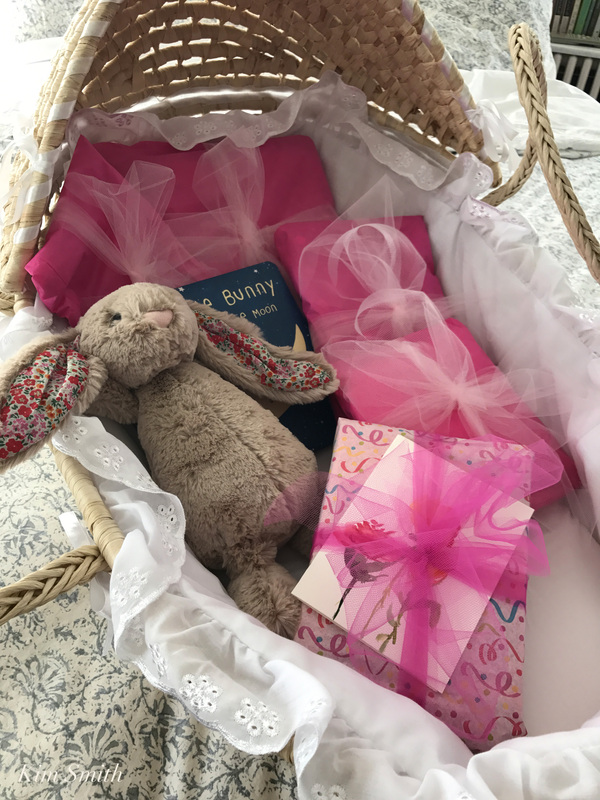 This entry was posted in Charlotte, Family, Home and Garden and tagged bandana baby quilt, Charlotte, David Sheldrick Wildlife Trust, how to make a bandana baby blanket, how to make a bandana baby quilt, J. Crew whale bandana, J.Crew elephant bandana, Wildlife Conservation Society on May 7, 2017 by Kim Smith.